Grocery shopping is an inspiring experience at the Food Emporium at 59th Street and First Avenue. 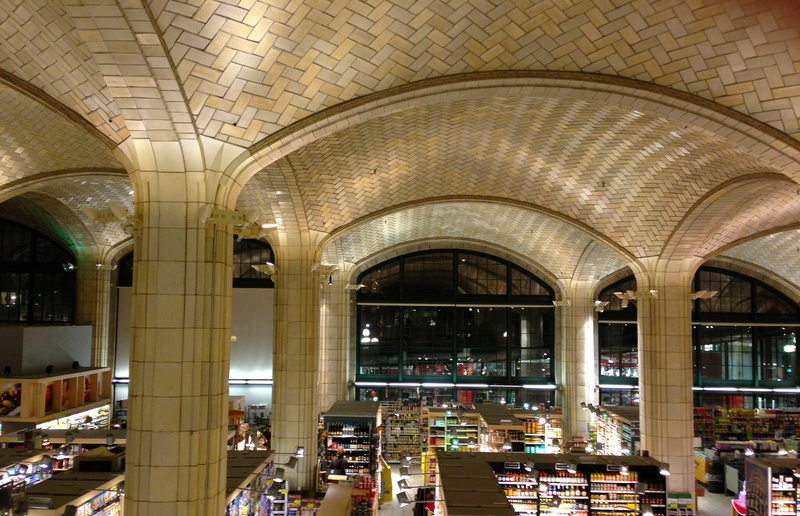 Instead of a box-like store with bad fluorescent lighting, this giant supermarket tucked beneath the Queensboro Bridge is like a cathedral, with graceful arches and pillars and beautiful vaulted ceilings lined with Guastavino tiles. 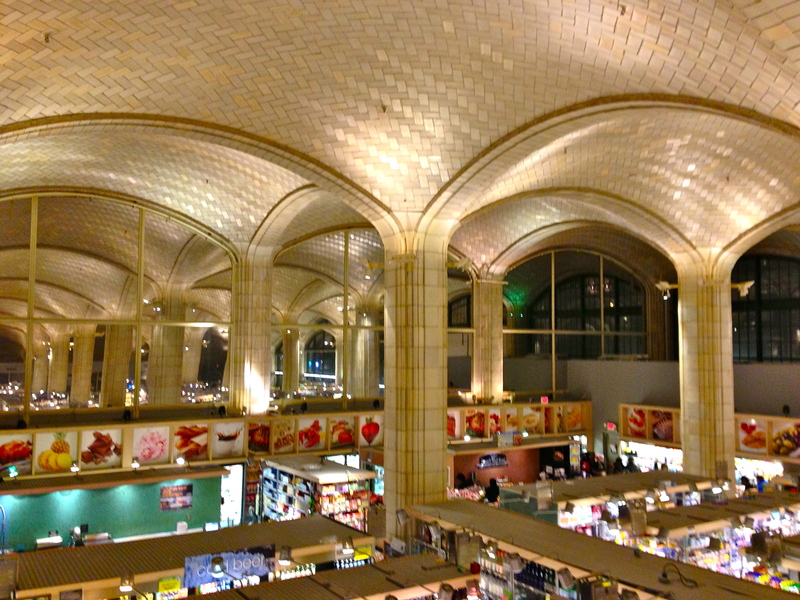 Bridgemarket, as the site is known, is one of many spaces in the city designed by architect Rafael Guastavino. 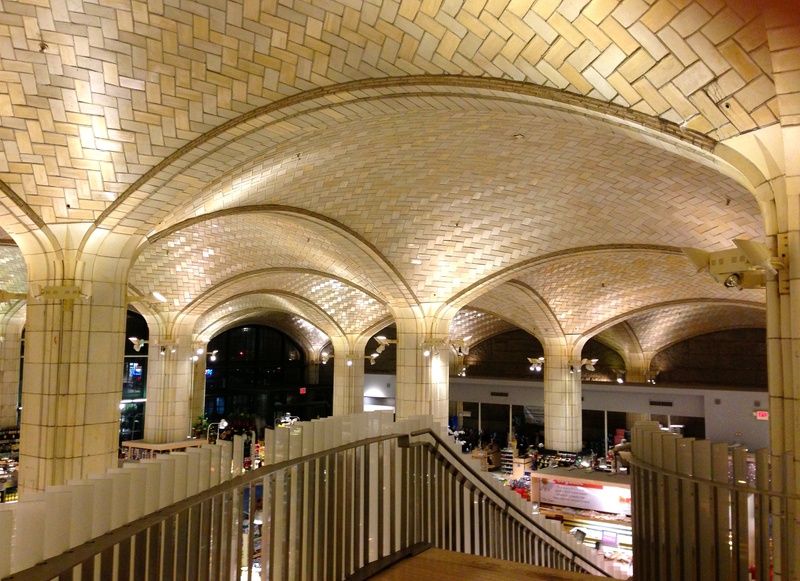 “Guastavino, an architect from Barcelona, pioneered the adaptation of a centuries-old vernacular building technology called the boveda catalana, or Catalan vault, in which long flat tiles are laid in courses and mortared together with a special mixture of portland cement and cow bay sand,” states Architecture Week. Bridgemarket didn’t get its name from its association with Food Emporium. The site actually housed a farmer’s market in the early 1900s. Guastavino also designed the vaulted ceilings of the long-closed, absolutely beautiful City Hall subway station. This entry was posted on January 6, 2014 at 6:48 am and is filed under Beekman/Turtle Bay, Fashion and shopping, Music, art, theater, Transit. You can follow any responses to this entry through the RSS 2.0 feed. You can leave a response, or trackback from your own site. Wow, I’ve seen this from the outside many times — I used to work just a few blocks away — but I never took the time to go inside. Next time I’m in the neighborhood, I’m definitely going in! Thanks for letting us “see” this gorgeous place. I’d seen it from the outside many times too, and this was my first time indoors. It’s incredible! There’s a mezzanine level where you can sit and gaze at the beauty. Another Guastavino marvel of design is the Church of the Holy Trinity on West 82nd Street. It is the only Byzantine style Roman Catholic Church in New York City.